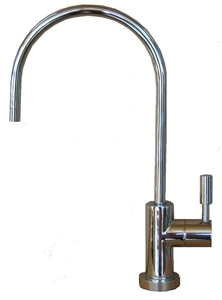 Custom Pure offers a variety of faucets. 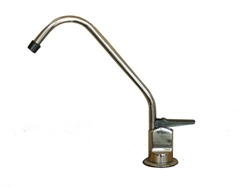 The Standard faucet is included with our under the counter filters. You can upgrade to different styles, colors and finishes to fit your decor. Our selection is presented below. The illustration at the right shows how to measure the dimensions of faucets. Follow this link to view details and shop online. This polished chrome faucet comes standard with all of our under the counter filters. The faucet lever flips up for full flow. You can also moderate the flow by pressing down on the lever. Meets NSF Standard 61. Height 8”, Reach 6”. We stock this in polished chrome. Other colors and finishes may be available through special order. 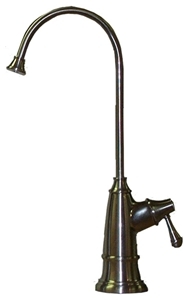 You can upgrade your filter purchase with this traditionally-styled faucet by Tomlinson. Its ceramic valve allows for hands-free regulation of water flow. Meets NSF Standard 61. Height 9”, Reach 5”. We stock this in polished chrome and brushed nickel (aka satin nickel). Other finishes are available by special order; to see the options, download the Tomlinson flyer (pdf). You can upgrade your filter purchase with this contemporary-styled faucet, by Liquatec. Its ceramic valve allows for hands-free regulation of water flow. Meets NSF Standard 61. Height 7”, Reach 6”. We stock this in polished chrome and brushed nickel. Other finishes are available by special order; to see the options, download the Liquatec flyer (pdf).